Mitch is on a perfect honeymoon but his girlfriend Katrina points out that they aren’t married. That’s the moment Mitch pulls out a ring and proposes. As he goes to get celebration drinks, killers pull up to the shore and shoot anyone in sight. Mitch tries desperately to save Katrina, he just can’t get to her in time. Eighteen months later, Mitch has infiltrated a terrorist cell online and gets combat training. He hopes to find the man who initiated the attack that killed Katrina and kill him. However, CIA has been watching Mitch’s every move. When Mitch finally travels to meet the cell, the CIA kills everyone inside but Mitch. They bring Mitch back to the US to question him. Irene, the Deputy Director, realizes that Mitch is an asset; and with the right trainer, he can become one of the best CIA operatives. The trainer Irene has in mind is Stan – Cold War Vet and Navy Seal. Stan knows Mitch is good but he is too emotional and doesn’t follow orders. However, Stan decides to give Mitch a chance and trains him. Training is cut short because 50 kilos of war-grade plutonium was stolen and it’s being turned into a weapon. This mission will be personal. Based on American Assassin by Vince Flynn, this movie is nothing new (FTC Affiliate Disclaimer). The jokes are average, the action is academic, and the plot is typical. Even the twist, while leaving it open for a part 2, is predictable. Now don’t be mistaken, it has some fun, action-packed sequences but they fighting style is standard in movies today. A saving grace is not having a love interest or “love story” thrown into the film for the sake of attracting female movie-goers. This makes the “revenge for killing my girlfriend” story a lot more believable. The best moments of the movie are not the fight scenes but the training senses. In these scenes, Bruce and Dylan got to play off each other and left a lasting impact in the movie. If you really want to see it, go to a matinee. Otherwise, wait it out. And be warned, the torture scenes hold nothing back. In the middle of a quaint piece of land, Mother is renovating “Him’s” house. She wants to restore it back to the glory he once knew. Mother’s husband is a poet but he hasn’t been able to write for a while. She continues to be positive while taking care of the home. One day “Man” comes to the home with the misperception that the home is a bed & breakfast. “Him” wants Man to stay because he has no other place to go. “Him” doesn’t consult Mother on his decision, but she prepares a place for Man to stay. The next day Woman shows up and lets herself in. She intrudes on “Him” and “Mother’s” space and their lives. While “Him” doesn’t mind, Mother wants them out. Soon, “Him’s” prize jewel is destroyed by Man and Woman. Instead of getting angry, “Him” boards up the office where the jewel once stood and allows them to stay as long as they want. The next day Woman and Man’s two sons come to the home. “Him” allows them in and they start to fight. The younger brother kills the older brother and runs off. Before the night is over, “Mother’s” home is swarmed by Man and Woman’s family and friends. They start to eat the food, break items, and paint the walls. It’s just too much for Mother to bear. But “Him” is inspired by the pain and wants everyone to stay. If “Mother” thought this was bad now, she has no idea what “Him’s” inspired writing will bring to their home. It’s just weird and disturbing. This feels like a mix of Tales of the Crypt, Rosemary’s Baby, Groundhog Day, and The Others all in one (FTC Affiliate Disclaimer). 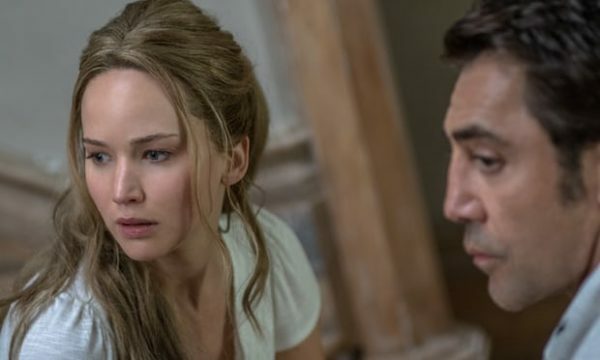 The audience is given the extreme close-ups of Jennifer Lawerence while being made to feel like one of the intruders with continuous use of shaky cam work. But knowing the following will help you understand the satire of this film. First, Mother is Mother Earth. Second, “Him” is the creator. Third, Man and Woman are Adam and Eve. Fourth, the brothers are Cain and Abel. And finally, their home is a symbol of the Garden of Eden. At first Man and Woman is enough but when they overstep their bounds everything falls fall apart. And more people come and bring destruction and war to Mother’s home. Mother is falling to pieces and we are the enemy. If you understand these symbols, the movie will make some sense. Now some scenes are just too much and will make you queasy and/or turn away. While it comes off as a suspense/thriller movie, this is truly a satire. This movie is great for a film student but everyone else can wait.